Not just a shapeless inflatable bag, this machine tensions the garment vertically and horizontally with padded metal forms to restore the garment to its original three dimensional shape. Perfect for tuxedos, jackets, overcoats, dresses, blouses, skirts and golf shirts. Finish your average garment in 12-15 seconds. The Hi-Steam JAM510 Tensioning Form Finisher makes quick work of finishing jackets, overcoats, dresses, blouses and skirts. Telescoping Form Adjusts in height to allow for finishing of long garments and overcoats. Front and Rear Blades Along with Inside Expanders - Holds the garment in the proper position and shape. 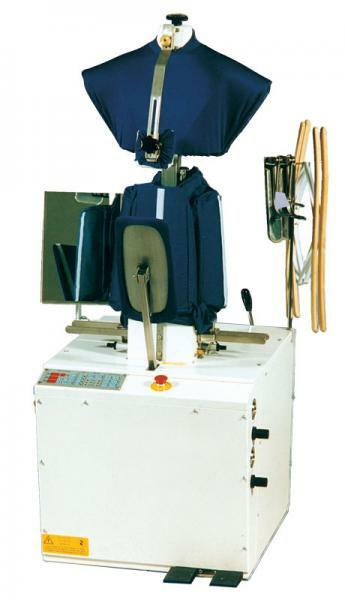 Foot Pedal Controls Allows both hands free for proper positioning of garment. Automatic Hydraulic Tensioning At start of steam cycle the form raises slightly to put the garment under tension. Especially important for wetcleaned garments. Microprocessor Control Panel 9 programs for steam, steam/air, and air cycles. Automatic Cycling One touch of the foot pedal closes all clamps, tensions garments, and starts steam/air cycle. Exclusion Buttons Prevents any combination of front and rear blade closing, side expanders opening, or vertical tensioning. No adjustment of individual air controls is necessary. Machine Dimensions 24” x 36” x 88"